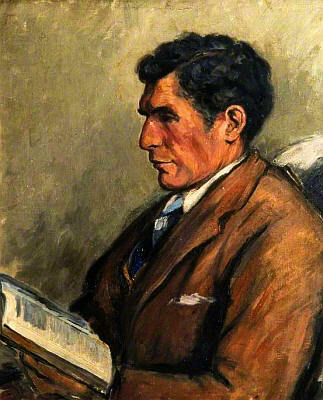 John Cowper Powys was a prolific novelist, essayist, letter writer, poet and philosopher, and a writer of enormous scope, complexity, profundity and humour. A powerful orator, he spent over thirty years as an itinerant lecturer in the United States, during which time he wrote his first four novels. In 1930 he retired to up-state New York and turned to full-time writing: it was here that he produced such masterpieces as his Autobiography, A Glastonbury Romance and Weymouth Sands. He returned to Great Britain in 1934, settling in North Wales in 1935, where. he wrote the historical novels Owen Glendower and Porius, the critical studies of Rabelais and Dostoevsky, and The Brazen Head and other inventive fantasies. Other notable novels are Wolf Solent and Maiden Castle: all of them are rich in characterisation, psychological analysis and evocation of place. The Pleasures of Literature demonstrates the breadth of his literary interests, The Meaning of Culture and In Defence of Sensuality the immediacy of his thought. Wolf Solent is the first of the great novels of John Cowper Powys and caused quite a stir when it debuted in 1929, garnering praise from many of the top writers of the day including Conrad Aiken and Theodore Dreiser. Wolf Solent has been frequently published in Britain and America from 1929 onwards, notably in paperback by Penguin in Britain. In it the title character returns to the Wessex countryside, which remains steeped in mysticism and romance. "At the striking of noon on a certain Fifth of March, there occurred within a causal radius of Brandon railway-station and yet beyond the deepest pools of emptiness between the uttermost stellar systems one of those infinitesimal ripples in the creative silence of the First Cause which always occur when an exceptional stir of heightened consciousness agitates any living organism in this astronomical universe. Something passed at that moment, a wave, a motion, a vibration, too tenuous to be called magnetic, too subliminal to be called spiritual, between the soul of a particular human being who was emerging from a third-class carriage of the twelve-nineteen train from London and the divine-diabolic soul of the First Cause of all life." Described as "the only novel produced by an English writer that can fairly be compared with the fictions of Tolstoy and Dostoyevski" by George Steiner in ‘The New Yorker’ and “The book of the century” by Margaret Drabble in ‘The Telegraph’. 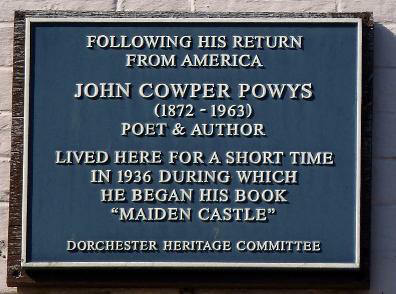 John Cowper Powys has been acclaimed by some of the greatest minds of the past century, from Henry Miller (‘my first living idol’) to George Steiner (‘supreme in English fiction after Hardy’) to Robertson Davies (‘a great writer’). A Glastonbury Romance, first published in 1932, is regarded by many as his masterwork, an epic novel of terrific cumulative force and lyrical intensity. In it, he probes the mystical and spiritual ethos of the small English village of Glastonbury, and the effect upon its inhabitants of a mythical tradition from the remotest past of human history - the legend of the Grail. Powys's rich iconography interweaves the ancient with the modern, the historical with the legendary, and the imaginative within man with the natural world outside him to create a book of astonishing scope and beauty. Powys tells the story of Jobber Skald - a large, somewhat brutish man, obsessed with the urge to kill the local magnate of the town because of the man's contempt for the workers of the local quarry - and his redeeming love for Perdita Wane, a young girl from the Channel Islands. Weymouth Sands boasts a striking collection of human oddities including a famous clown, his mad brother, a naive Latin teacher, a young philosopher, and an abortionist. At the centre of the novel is the aptly named Dud No-man, a historical novelist widowed after a yearlong unconsummated marriage to a woman who continues to haunt him. Inspired by pity and his own deep loneliness, Dud takes Wizzie Ravelston, an itinerant circus performer, into his home and heart. Their awkward yet endearing efforts to create a life together unfold in counterpoint to the romantic and familial relationships that sizzle and simmer in the county town of Dorchester. Yet even as the characters in Maiden Castle struggle with the perplexities of love, desire and faith - readjusting their sights and affections - it is the looming fortress of Maiden Castle that exerts the otherworldly force that irrevocably determines the course of their lives. It is the year 1400, and Wales is on the brink of a bloody revolt. At a market fair on the banks of the River Dee, a mad rebel priest and his beautiful companion are condemned to be burned at the stake. To their rescue rides the unlikely figure of Rhisiart, a young Oxford scholar, whose fate will be entangled with that of Owen Glendower, the last true Prince of Wales - a man called, at times against his will, to fulfill the prophesied role of national redeemer. Psychologically complex, sensuous in its language, vivid in its evocation of a period shrouded by myth, ‘Owen Glendower’ tells a compelling story of war, love, and magic. "Porius stood upon the low square tower above the Southern Gate of Mynydd-y-Gaer, and looked down on the wide stretching valley below." So begins one of the most unique novels of twentieth-century literature, by one of its most ‘extraordinary, neglected geniuses,’ said Robertson Davies of John Cowper Powys. Powys thought Porius his masterpiece, but because of the paper shortage after World War II and the novel's lengthiness, he could not find a publisher for it. Only after he cut one-third from it was it accepted. This new edition (Overlook, 2007) not only brings Porius back into print, but makes the original book at last available to readers. Set in the geographic confines of Powys's own homeland of Northern Wales, Porius takes place in the course of a mere eight October days in 499 A.D., when King Arthur - a key character in the novel, along with Myrddin Wyllt, or Merlin - was attempting to persuade the people of Britian to repel the barbaric Saxon invaders. Porius, the only child of Prince Einion of Edeyrnion, is the main character who is sent on a journey that is both historical melodrama and satirical allegory. A complex novel, Porius is a mixture of mystery and philosophy on a huge narrative scale, as if Nabokov or Pynchon tried to compress Dostoevsky into a Ulyssean mold. Writing in The New Yorker, George Steiner has said of the abridged Porius that it "combines [a] Shakespearean-epic sweep of historicity with a Jamesian finesse of psychological detail and acuity. Faulkner's Absalom, Absalom!, which I believe to be the American masterpiece after Melville, is a smaller thing by comparison." This new, and first complete, edition of the novel substantiates both Steiner's judgement and Powys's claim for Porius as his masterpiece. Published between A Glastonbury Romance and Maiden Castle AUTOBIOGRAPHY is a vital and uninhibited self-portrait by one of the major literary figures of the twentieth century. With unparalleled wit, candour, and lyricism, Powys, at the age of sixty, set out to chronicle his life. He wrote: 'I have tried to write my life as if I were confessing to a priest, a philosopher, and a wise old woman. I have tried to write it as if I were going to be executed when it was finished. I have tried to write it as if I were both God and the Devil.' AUTOBIOGRAPHY conveys Powys's contagious excitement of his discovery of books and men and his unceasing discovery of himself, as well as fascinating reminiscences of the remarkable journeys, both geographic and intellectual, of his life. 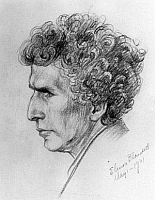 John Cowper Powys's works have been described as 'the only novels produced by an English writer that can fairly be compared to the fictions of Tolstoy and Dostoevsky...with an immensity to which only Blake could provide a parallel in English literature' (George Steiner, The New Yorker). His AUTOBIOGRAPHY is a work that stands alone in autobiographical literature and is the one of the most admired of his books. John Cowper Powys: A Selection from His Poems Ed. Kenneth Hopkins. London: Macdonald, (1964). "A Glastonbury Romance is deeply flawed, yet utterly remarkable"
by Michael Henderson in The Telegraph. It is not hard to understand why John Cowper Powys has never had the recognition he deserves as one of the twentieth century's most remarkable novelists. Until he was nearly sixty he earned his living as an itinerant lecturer, much of the time in America, where he thrilled his audiences by his seeming ability to transmit, medium-like, the inmost thoughts of the writers he loved. For a time Powys's electrifying performance as a kind of literary magus attracted a considerable following. His admirers included some of America's best-known writers - Theodore Dreiser was a notable supporter, for example - but Powys's method of 'dithyrambic analysis' never caught on. An idiosyncratic exercise that he described as 'hollowing himself out' so he could become the writer he was interpreting, it was too obviously adapted to the needs of the lecture circuit and the quirks of Powys's personality to have any lasting influence. Powys removed himself further from any kind of critical acceptance when, in an effort to generate an income that would enable him to give up lecturing, he published a series of self-help manuals. With titles like The Art of Forgetting the Unpleasant and In Defence of Sensuality, these forays into popular psychology were refreshingly unorthodox in their prescriptions for personal happiness; but they reinforced the perception of Powys as an eccentric figure flailing about on the outer margins of literary and academic respectability. In fact, respectability was never one of Powys's goals. Both in his writing and his life he scorned conventional standards of success and followed his own, frequently conflicting inclinations. Easily moved by sympathy and always recklessly generous with money, he could at the same time be extremely cunning in satisfying his own needs, which were often strikingly bizarre or perverse. In his Autobiography (a tour de force of shameless self-revelation that has been justly compared to Rousseau's Confessions), Powys wrote that all his life he was pursued by fear - fear of the world and other people but above all fear of his own manias, 'perpetual forms of madness' that dogged him throughout much of his life. From his earliest years Powys believed he possessed 'some obscure magical power' to realise his desires, but many of these involved sadomasochistic fantasies which filled him with horror and of which he was able to rid himself only after many years of effort. Describing himself as an 'anti-narcissist' who spent his life running away from himself, Powys escaped from his manias - which included a loathing of spiders and a horror of his own shadow among many other besetting anxieties - by employing 'an elaborate psycho-analytical psychi-psychiatry of my own invention'. Tapping his head on stones and trees, praying to assorted deities on behalf of suffering creatures human and animal, long peregrinations with named walking sticks as his regular companions - these and other compulsive daily rituals allowed him to forget his psychic and physical ailments (he was plagued by ulcers and chronic constipation) and freed him to write. Born in 1872 into a clerical family with literary and aristocratic connections as the first of eleven children, two of whom - Theodore and Llewelyn - also became highly original writers, Powys grew up in the stifling gentility of a Victorian country vicarage. Yet he is in some ways the most modern of writers, taking the dissolution of orderly society for granted and focusing on the shifts and turns of the solitary consciousness with an intensity reminiscent of Proust. As in Proust, Powys's central protagonists are introverted, almost solipsistic figures, who find relief from the sense of being 'contingent, mediocre, mortal' in sudden epiphanies, which they try to preserve in memory. However, whereas Proust's epiphanies occur always indoors in a self-enclosed human world, Powys's were found in the open fields and coastal vistas of his native Dorset - a more-than-human landscape that frames his greatest novels. In Wolf Solent and Weymouth Sands, perhaps the most accomplished of the Wessex series of novels that includes the panoramic Glastonbury Romance, Powys evokes the floating world of moment-to-moment awareness as found in a collection of characters living on the edges of society, struggling to fashion a life in which their contradictory impulses could somehow be reconciled. The fusion of introspective analysis with an animistic sense of the elemental background of human life which he achieves in these books is unique in European literature. More than most writers Powys used his memories to create his fictions, but the greatest of these fictions was his own personality. As Morine Krissd�ttir shows in one of the most arresting literary biographies in many years, Powys - a 'sworn hater' of dreams, which he loathed for the revelations they contained of his only half-successfully repressed obsessions - gave himself over to the conscious creation of a fantasy world in which he could live as the magician he had imagined himself to be as a child. The problem with inhabiting such a dream world, of course, is that it unavoidably contains real people who may not be willing to act the part given them in the fantasy-script. Powys struggled constantly with this fact, which bedevilled his relations with the women in his life. Having made a conventional marriage to the sister of a Cambridge friend, apparently mainly in order to please his family, he went on to spend most of every year in America. It was there that he met the two women he loved - the 'girl-boy' Frances Gregg, lover of Ezra Pound and Hilda Doolittle, with whom he began a stormy relationship in 1912, and Phyllis Plater, whom he met in 1921 and who became his lifelong companion. It was in his relationship with Phyllis - a slight, nervous, intensely creative woman he called 'the T T', or 'Tiny Thin' - that the tension between Powys's dream world and the reality of other people became clearest. Phyllis loved the social and intellectual stimulus of big cities, while Powys craved a sequestered existence in a peaceful rural landscape that reminded him of his Dorset home. Krissd�ttir writes that Powys viewed Phyllis as 'his slender Welsh fairy sylph, his elemental; but elementals are designed for dancing in the midnight air, not for washing floors'. Certainly the sylph was Powys's own creation, a figment with only a passing resemblance to his flesh and blood partner, who found the drudgery and isolation of life with him - first in upstate new York, then Dorset and finally Wales, to which Powys moved in 1935 and where he died in 1963 - hard to endure. Yet the fact remains that the two were together for over forty years, during which Phyllis made a profound contribution to Powys's most innovative and enduring work. In the end Phyllis may have shaped Powys - the self-styled shaman - more than he shaped her. Using a mass of new material, Descents of Memory is an inspired study of the tangled and precarious life of an absurdly neglected writer. Unsparing in her description of his exotic array of neuroses and the ways in which he manipulated people to sustain his dream-life, yet full of admiration for his dauntless energy and generosity of spirit, Krissd�ttir is clearly deeply torn in her view of the man. She never doubts the extraordinary quality of his best work. Like Powys himself, she sees his vast prose poem Porius - one can hardly call it a novel - as in some sense the culmination of his life's work. For the first time published in the unabridged form Powys intended, this rambling fairy tale of the Welsh dark ages presents Powys's mythic world of animate nature and magical transformations on an epic scale. Written in early old age, Porius is an enchanted labyrinth reminiscent of Finnegan's Wake. 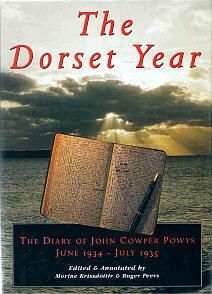 For most readers the Wessex novels offer a more accessible way into this Dorset Proust. Seeking a sort of salvation in distilled sensation, Powys turned to memory in an attempt to master time. Whether or not he achieved any kind of personal redemption (Krissd�ttir's biography suggests otherwise), he came as close as any modern writer to capturing the inner flux.